In 1952 the neurophysiologist Nathaniel Kleitman and one of his students, Eugene Aserinsky, studied the rolling movements of the eyes which occur early in sleep. They attached electrodes which responded to eye movements to the temples of volunteers who came to sleep in their laboratory. As the volunteers began to fall asleep, the electrodes detected the slow rolling eye movements which could be seen easily through their eyelids. Soon after, the volunteers fell deeper into sleep and their eyes became still. An hour or so later, to the great surprise of Aserinsky, the pen recorders showed that the eyes were moving again. This time they were not just swinging from side to side but were darting back and forth (see figure 2). These rapid eye movements continued, for some time and then the eyes came to rest again. These phases of rapid eye movement (R.E.M.) occur every ninety minutes or so and represent a distinct and important stage of sleep. The huge slow waves of normal sleep are replaced by a higher frequency pattern closer to the brainwaves of the normal waking state. 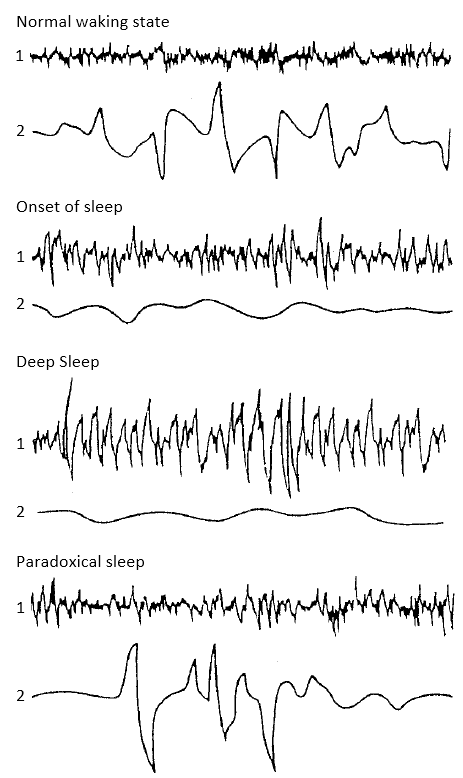 In this state of ‘paradoxical sleep’, it is more difficult to wake the sleeper even though the brain is active. Indeed, most of the muscles of the body are paralysed, cut off from the restless activity of the brain by inhibitory signals from a tiny region deep in the brainstem. The only responses to the brain activity are the eye movements and the occasional twitching of fingers or the grinding of the teeth. During this period of paradoxical sleep, vivid wild dreams usually occur. People deprived of this stage of sleep show many more signs of a sleepless night than if they have been woken at other times during sleep. Moreover, the following night they spend more time than usual in paradoxical sleep, as if they need to catch up on the dreams they had ‘lost’. This discovery has led to the identification of regions within the reticular formation of the brainstem which might control this specific phase of sleep. Figure 2: These signals were picked up with electrodes stuck to the scalp and face of a volunteer In each case the upper trace (1) shows the electroencephalogram, which reflects the activity in the cerebral cortex, while the trace below (2) shows the movements of the eyes.